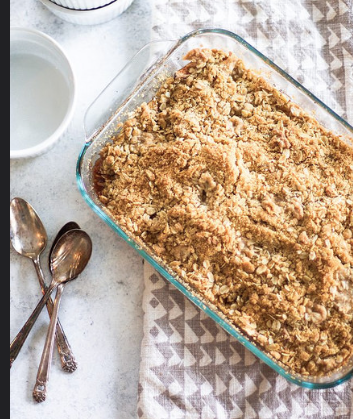 Apple crisp is a perfect dessert in the fall and even throughout the winter months when apples are in season. It’s wonderful to have a nice warm treat at the end of a cold day. No need for a heavy crust. This sweet dish hits the spot! Add to a large mixing bowl and add the remaining filling ingredients. Toss to combine then place in a 9×13 or similar size baking dish. Rinse and wipe out the mixing bowl and add all topping ingredients. Stir to combine, using fingers to break up any large clumps. Pour over apples in an even layer. Bake for 50 minutes to one hour uncovered or until filling is bubbly, apples are tender and topping is golden brown. Let rest for 30 minutes before serving.